I don't know what happened... but my knitting mojo came back full force. It just hit me one day when I was least expecting it and now I want to knit all the things. I have two great projects on the needles at the moment. Mindless hat knitting using this gorgeous Storyteller yarn that I picked up during a recent trip to Lake Tahoe. 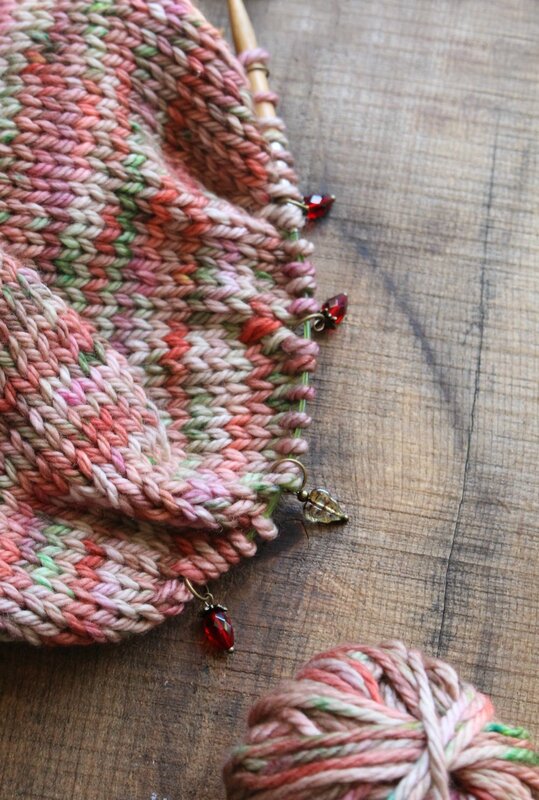 I am making up Hannah Fettig's Simple Hat and it is a great project for this yarn. Simple stockinette really shows off the beautiful colors. I love picking up yarn on vacation to have that physical memory of that experience whenever I knit with or wear the finished item! I am using our new Strawberry Stitch Markers on this project... aren't they adorable? You can find those available HERE. Up next is... another design project! :) I am sooooo excited about this one. I have had an idea floating around in my brain for the past few years about designing with multiple yarn weights and I am bursting with inspiration and new design ideas. I'm hoping I can squeeze a collection based on this idea in 2019. On one last note... I started this blog in 2007 and have enjoyed it immensely. But over the years I have noticed that social media has taken the forefront in online sharing. Sometimes I wonder if blogs still are read and if they have a place in our fast-paced online community. Would you take a moment to leave a comment and let me know how you feel about blogs in 2018? Do you still take the time to read blogs or do you prefer consuming content from other sources like Instagram or Facebook? Would you like to see me share on my blog more? Your input would be very much appreciated!